Looking for worthwhile outdoor tools to get the job done can be frustrating. 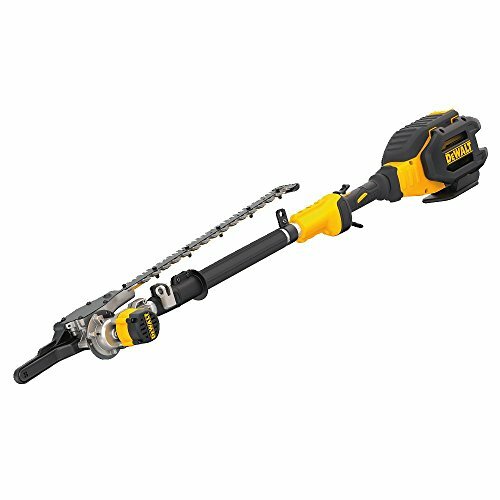 If you are looking for a pole hedge trimmer that can get the job done check out the DEWALT DCHT895M1 Telescoping Pole Hedge Trimmer. This one is well worth adding to the garage or shed. A 40 volt Max battery operated pole hedge trimmer that can operate up to an hour and a half per charge! It is a beast among pole hedge trimmers. With a 22 inch dual sheer laser cut hardened steel blade it can cut. If you are in need of power look no further this one is sure to please you with its ability to perform. 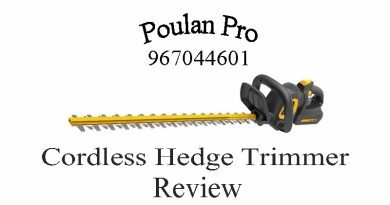 If you would like to learn more read the full review of the DEWALT DCHT895M1 40V MAX Telescoping Pole Hedge Trimmer. Before we get into the full review of the DEWALT DCHT895M1 let’s take a look at some of the key features that makes this particular pole hedge trimmer so great. 22 inch dual action laser cut hardened steel blade. 40 volt MAX lithium Ion Battery. Articulating head with 8 locking positions. Telescoping shaft that goes from 45 inches to 70 inches for extended reach. 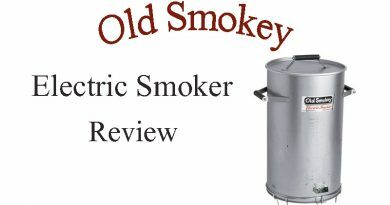 3 year limited warranty with 1 year free service and a 90 day money back guarantee. The first thoughts of the DEWALT DCHT895M1 Telescoping Pole Hedge Trimmer, is that it is a powerhouse. It has a 40 Volt MAX Lithium Ion Battery that can hold up to an hour and a half of runtime to make getting the job done easier and faster, allowing more operating time before having to charge. 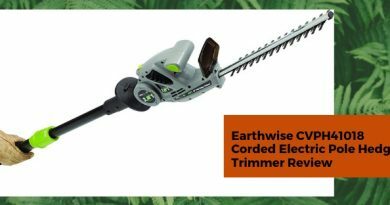 The 22 inch dual action laser cut steel hardened blade can make short work out of problem shrubs, hedges and bushes. It can take up to a 1 inch wide branch with no problem. 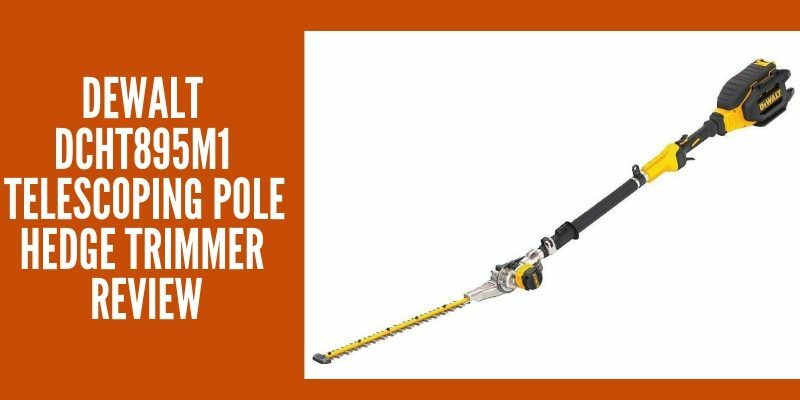 The pole hedge trimmer is 60 inches x 8 inches x 9 inches at 15.8 pounds. It pushes the edge of being lightweight so using the shoulder strap that is included is a good idea. Being battery operated there is no need to have gas and oil on hand. No need for yearly tune ups and no more spills in the garage or on the pavement or lawn while trying to fill. Another great advantage to having a battery operated pole hedge trimmer is that it does not consume nonrenewable resources which in turn lessens toxic emissions, the carbon footprint and is healthier for the environment. Let us not forget there is no need to drag heavy cords around either or accidently hacking them up while operating. The fact that DEWALT DCHT895M1 Telescoping Pole Hedge Trimmer is battery operated unit is great for people like me who struggle with cords and spilling. The cutting and trimming capacity of the DEWALT DCHT895M1 Telescoping Pole Hedge Trimmer is phenomenal. It has the ability to tackle branches up to 1 inch across. Powered by a brushless motor that delivers 3700 strokes of the blade per minute it powers the 22 inch dual shear blade that is made from laser cut hardened steel. It has a telescoping shaft that can go from 45 inches and extend up to 70 inches to reach tall hedges and branches. This is a 15 percent increase over most gas operated pole hedge trimmers. The DEWALT DCHT895M1 Telescoping Pole Hedge Trimmer has an articulating head that can be locked into 8 different positions, with 15 degree increments. This can make tackling angles a breeze. The DEWALT DCHT895M1 40V MAX Telescoping Pole Hedge Trimmer is a pretty simple unit in regards to extra features. It has an easy start button so no more yanking on pull cords, straining your shoulders and body. There is a shoulder strap that is included to help distribute the weight of the tool. This is really great as the unit is 15.8 pounds. The brushless motor really contributes to cutting down on noise and it is much quieter than its gas operated predecessors. Also included is a blade cover to help prevent any accidents or damage to people and objects while not being used. Our final thoughts on the DEWALT DCHT895M1 Telescoping Pole Hedge Trimmer is that it a powerful well-built unit that has the ability to deliver. Being battery operated in this day and age is a desirable feature and this one can provide you with plenty of cutting time to get the job done. 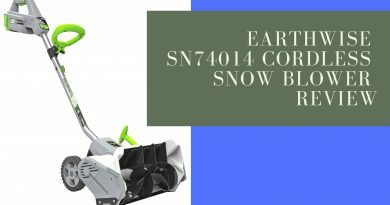 With its articulating 8 position head you can get almost any angle you may need to make your hedges and bushes the best on the block. Not to mention its brushless motor can provide 3700 brushstrokes per minute and allow you to work without waking the neighborhood. No longer do you need to have cords or gas, no tune ups and spark plugs. This 40 Volt MAX Lithium battery operated model can perform just as well if not better than gas or corded. Also you can interchange the battery with other DEWALT 40 volt MAX tools. This feature can save lots of time and money to a homeowner. 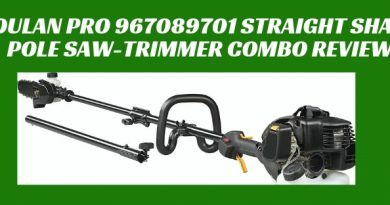 While the model is heavier than some it does have a shoulder strap to help distribute the weight and when you compare the overall unit and its features the DEWALT DCHT895M1 Telescoping Pole Hedge Trimmer is sure to please.